Welcome back! This week we will be looking at a book set in medieval times back when England still owned part of the land we know to be owned by France now. I found this book slow to start compared to a number of other books that I read, however once I got about half way through the second chapter I felt myself engaging with the story a lot more and starting to look forward to my reading time. We start of with our main characters at a young age when a village has been attacked and Royce’s knight leads their regiment to stop and assist the village. Royce being the eager, new squire that he is gets sent out of the bloodbath scene to compose himself and discovered Ana (Juliana) hiding under a boat with no memory of her past. At this stage I was sitting there thinking “Great, what have I gotten myself into? This feels like it’s going to be a very boring book to read”. I felt like this because I didn’t remember buying a book that was all about battle, trauma and death. And also because Kathleen has written this in an older style of English I found I had to concentrate a little bit more than normal to fully grasp the story that was being told. That is until I got into the second chapter where I was then left wondering what had happened. Why were we jumping forward 10 years? And why had the portrayal of the book swapped to Ana? I found the switch in the portrayal to Ana odd as most medieval books I’ve read are in either the guy or the girls point of view. And it doesn’t typically swap between then. However Kathleen has done just this. She swaps between them enough that I feel like I understand bother characters, but not so much that it feels weird. I also think I’d adjusted to her writing style a little bit easier than I had with Bleddyn Hall which allowed me to begin enjoying the book more rather than spending my energy trying to figure out what was happening. 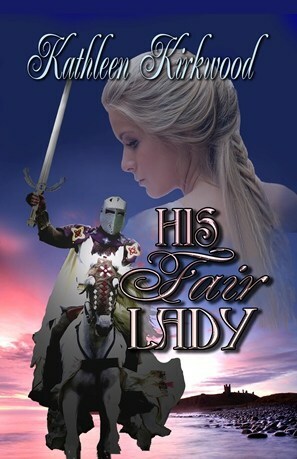 While Royce battled Ana’s insistence that she wasn’t the heiress he believed her to be, he held back telling her that he was her squire not knowing how she would react. Not realising that Ana was in love with the squire from her memory of 10 years past. And this continued to happen even after it was proved that Ana was the heiress until the time when Royce brought Ana’s foster parents to England to help her feel more at home and welcomed. Ana struggled at first adjusting to a different way of life, different duties, different responsibilities and different expectations of how she should live her life. Royce was doing what he could to assist her but at the same time was trying to marry her off and establish his own property while also gaining influence at court to work to help all. I felt that given there was only a few months before an engagement for Ana needed to be announced, Royce could have done more to help her adjust to her new life and a smoother transition rather than just shoving her into that role and expecting her to figure it out. Yes Ana didn’t do everything she could have to help herself, and resisted this change as she didn’t believe she was the heiress. I could understand her reservations and wanting proof that couldn’t be argued with before accepting her new position as a lady of England. I know myself that when I’ve had my job role changed and haven’t received support to be able to make this transition that I resisted the change and made life difficult for my managers. And I at least had the choice to leave, whereas Ana doesn’t. So I can really sympathise with how she’s feeling, but I get the feeling that she’s still very immature and quite selfish by not considering how her actions could be impacting those around her. Needless to say, when she “sinned” and sought confession and penance I was happy that the Friar used this penance to get Ana to learn her role as a lady properly and to treat Royce with more respect. From this she began to apply herself to her lessons and discovered that being a lady wasn’t all sitting around looking pretty, embroidering etc. And that the work she needed to do to keep her estate running smoothly took just as much energy and effort as it took the commoners to execute these tasks. And this came just in time! After Ana and Royce go through a turbulant time trying to foil some French guy claiming to be Ana’s cousin Ana is able to use these new skills to succeed. When this guy was introduced my first thought was “O cool! Ana has more family! That’s amazing!” But then when we went to Ana and she was instantly scared by this guy and his scar seemed to make her think of blood and death I started to feel a bit skeptical. What kind of cousin would make her think of her horrible past? When said cousin kidnaps her and threatens to kill her we learn he was the one responsible for the death of her mother 10 years prior and the village. And this is when the adrenaline pumping chase begins! Royce chases after them when he realises that she’s been kidnapped and tries to save her from certain death. Kathleen really draws this out because it seems like Ana is safe, except then she’s not, and then she’s even more not safe! Only to have Royce arrive to save the day, except then he’s in trouble too… and then we don’t know if the “cousin” or Royce has survived the battle. While I was reading this series of event’s I felt like I’d held my breath because it feels so intense. As is normal with romance books, there is a happy ending. And in this case it’s even happier because as a formal wedding present the king gifts Royce with funds and knights to rebuild his dilapidated estate, while he then gifts Ana with her father’s property which coincidentally had the last owner die leaving the property without an owner just recently. I’m not sure if I’m happy with the ending, purely because it feels like coincidentally too many things “just happened” to fall exactly in a way that made it feel like an even happier ending than it would have been otherwise. Overall, I felt like there were sections of the book that were amazing and really kept my attention. Whereas there were other sections that I felt were a little bit lacking and I found myself loosing interest until the next exciting thing happened. I also felt like it dragged on a little bit. I felt at times that I was sitting there going “Really?! I’ve been reading for days and I’m only 50% of the way through? !” but I still enjoyed reading it so please don’t let this turn you off. Just be prepared that it’s a long book! Thankyou again for reading, next week I will be reviewing “The Sheik’s Son” by Nicola Italia.